Long time ago there lived a monkey named Red-face on a tree by the side of the sea. The tree was an apple tree and the fruits it bore were sweet as nectar. Once a crocodile named Ugly-mug swam ashore, Red-face threw apples at him and asked him to taste them. Ugly-Mug started coming everyday ashore to eat the fruits thrown by Red-face and soon they became good friends. Ugly-Mug used to take some fruits to his home to his wife. His wife was a greedy lady and asked him as to where he got the nectar filled apples. Ugly-Mug told about his friend the monkey. The lady was greedy and pleaded with her husband that she would like to eat the monkey's heart, as a person who gave such tasty fruits must have a heart filled with nectar. Ugly-Mug was angered and did not agree to deceiving his friend. But she then insisted on not eating anything till he brought her his friend's heart. Out of desperation, Ugly-mug started making plans for killing his friend. He came back to Red-face and treated him with an invitation to his house for supper stating that his wife would be thrilled to have him home and also that she was very anxious to meet such a nice friend. Poor Red-face believed the story but was asking his friend as to how he could cross the sea to reach the house of the crocodile on the other side. Ugly-mug then offered to carry him on his back and the monkey agreed. In the middle of the sea, Ugly-mug took the crocodile deep into the ocean to kill the monkey. 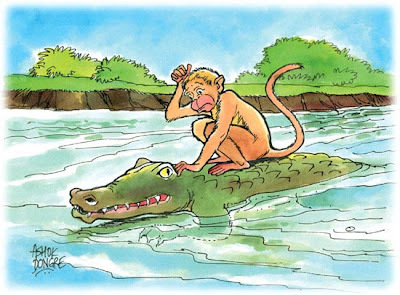 The monkey was frightened and asked the crocodile why he was doing this. Ugly-mug told him that his wife wanted to eat the monkey's heart filled with nectar. Red-face immediately asked the crocodile to take him back to the tree as he told him that he had left his other heart which was full of nectar back at the tree. The foolish crocodile then swam back to the tree and the terrified monkey jumped up the tree never to return. Upon being asked as to why she was not returning, the monkey answered to the crocodile that he had only one heart and he had been fooled and scolded his friend for misusing his friendship. The crocodile was ashamed at what happened and asked the monkey if he could make any amends. He was also scared that his wife would not let him back in because he had returned without the monkey's heart. Just then he heard that a huge he-crocodile had occupied his house. The monkey advised him to fight the he-crocodile and drive him out of his home and gain his wife's confidence. The crocodile followed the advice and he was back happy with his wife. Story moral: Intelligence wins over might.